When it comes to your promotional needs, 1 Stop Promotions is fast, efficient, and cost effective. We know how important your deadlines are, and we do our best to get your order filled on time, every time. 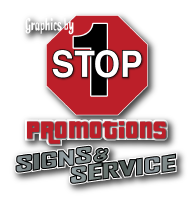 1 Stop Promotions has built a reputation in North Bay for quick and creative promotional solutions no matter what the job. With many different styles, colours, and sizes to choose from, 1 Stop Promotions is hard to beat. Visit 1 Stop Promotions in North Bay to see our collection of promotional items.